Marcel Fässler’s drive in the No. 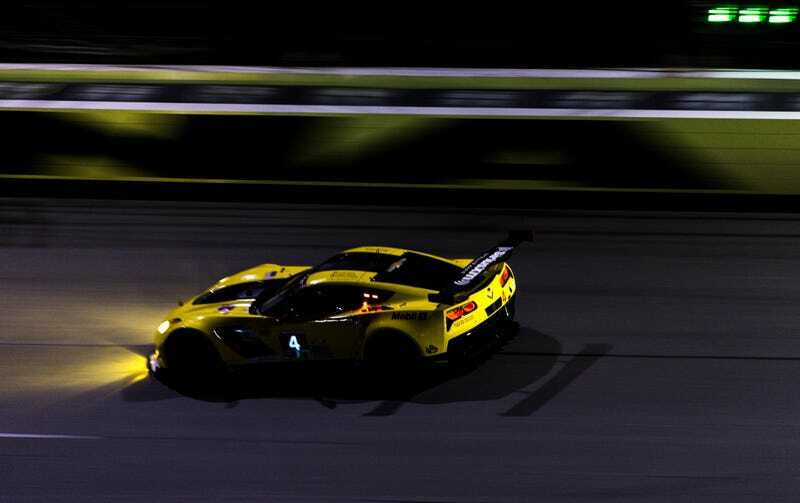 4 Corvette C7.R was abruptly interrupted by a complete electrical failure. The car shut off and Fässler had to pull off to the side, almost being taken out by the race-leading Cadillac DPi-V.R of Max Angelelli in the process. The No. 4 Corvette had taken a minor hit earlier in the sixth hour of the race by the No. 69 Ford GT of Harry Tincknell in a ‘Murica-on-’Murica incident. No word as to whether that knocked anything loose to cause the electrical failure. Fässler has driven with the Corvette team before, however, his last big drive was with the shuttered-by-Dieselgate Audi R18 team. Fässler’s bad luck continues, I guess. The No. 4 was also the car that turned into an impromptu car-b-que at this year’s Roar Before the 24, so it’s on a string of crappy luck, too. Corvette Racing was able to restart the No. 4 behind the pit lane wall and has now sent it back with Oliver Gavin at the wheel. Sadly, it is now 5 laps behind the GTLM class leader. Rain has now made its way to the track, so don’t expect the mayhem to end any time soon. Fresh rain makes things extra-slick, and this probably going to get even crazier soon.